Why are these fixtures so popular? 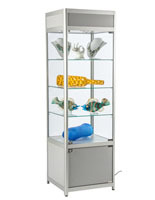 These cheap display cabinets are affordable and feature a knockdown design, making them an ideal choice for any retail store, trade show or gallery. 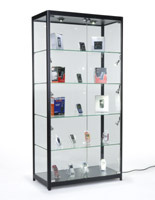 Users can features these glass showcases at events with their easy-setup and disassembly design. All of these cheap display cabinets, or discount storage cases, are part of the Essential or Simple lines that feature a more affordable price while still retaining a professional look. 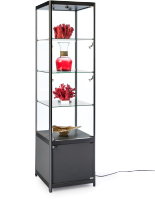 The curio stands feature commercial grade quality and both light and dark finishes that will fit into any interior they're placed. 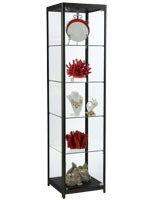 Cheap display cabinets in the Essential DIY are shipped unassembled to further save on costs, and can be set up without difficulty. 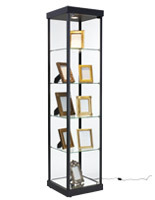 While these stands might look the same, they each have different attributes that make them unique. What features make these event storage cases excellent for exhibiting curios? 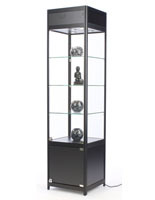 Each of the cheap display cabinets is made of durable tempered glass that allows passersby to see all of their contents. This material is incredibly strong and if broken, forms small granular chunks instead of dangerous jagged shards. The knockdown furniture's shelves are made from this as well for full visibility. 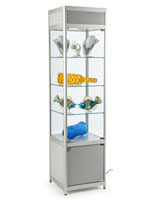 Two styles of these glass showcases for retail stores and trade shows are available: the thin tower models and the wider fixtures. Shop owners will a small corner or center space to fill can choose the former, while the latter is great either as a centerpiece or up against a wall. Both frames feature 360° visibility, so the only main difference is their size. 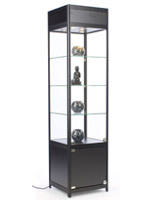 As previously mentioned, these retail display cabinets come in a choice of two finishes to fit in with either light or dark interiors. The two options are a modern black appearance or a sleek silver surface. Either finish is both neutral to complement any space, yet attractive to grab peoples' attention. Most of the cheap display furniture features bright LED or halogen lights for illuminating merchandise samples at trade shows. 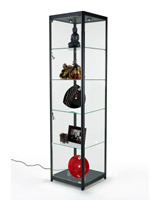 Discount storage cases for retail stores can have bulbs mounted on the top, on the sides or as standing spotlights for full illumination. Side units can be adjusted for presentations with custom lighting. 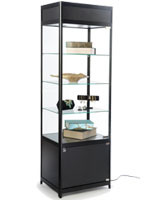 Another feature of the commercial display cabinets is their locking, swing-open door. All models shown here will keep valuable curios secure from theft and tampering. Additionally, some of these knockdown storage cases feature an enclosed base for storing materials out of sight. 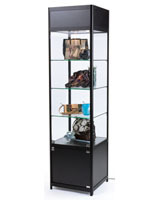 For extra customization, these commercial event glass showcases often come with adjustable or removable shelves for accommodating larger items. They often include adjustable floor levelers for stability as well. Users don't need to worry about uneven flooring because the stands can accommodate any room. Whether they're being used for commercial or home use, these cabinets will make complement any room. Galleries and museums often use them to exhibit art pieces and other artifacts. Schools can use them to put a spotlight on trophies or exemplary projects made by students. 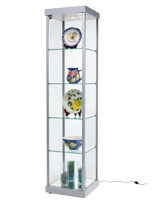 In the home, they can feature family heirlooms, collectibles and other keepsakes. 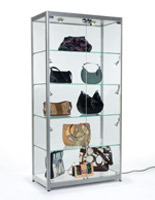 Order online from DisplayCabinets2go.com today for quick same day shipping on all models shown here!